NASA’s Juno spacecraft successfully achieved orbit around Jupiter Monday night to mark the end of a 2.8-billion Kilometer journey and the start of a 20-month mission of discovery studying the king of the Solar System’s Gas Giants. Celebrating Juno’s arrival in the early hours on Tuesday, the mission team quickly shifted into the next phase of the flight to transition Juno to science mode. Blazing over Jupiter’s north pole Monday night, Juno descended into areas of extreme radiation and had to avoid possibly lethal dust particles before firing up its main engine to hit the brakes to be captured into orbit around the planet. 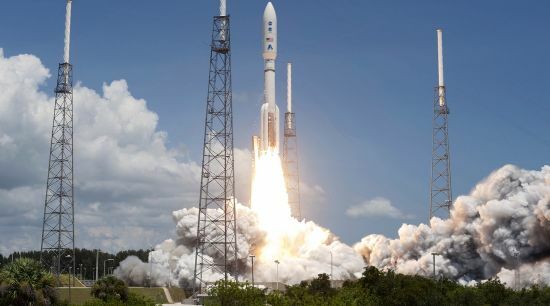 Jupiter – 11 times wider & containing 300 times more mass than Earth – had been pulling the spacecraft in since May, accelerating it on its hyperbolic trajectory. 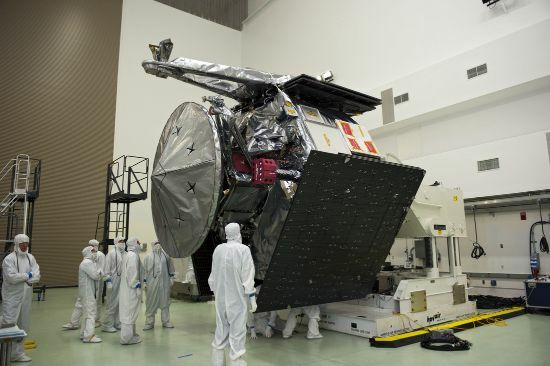 Monday’s night’s maneuver was executed to perfection – Juno fired its Leros 1b engine for 35 minutes and two seconds, hitting its target within 1.2 seconds of the predicted time prior to launch in August 2011. Using a self-igniting propellant mix, Leros 1b fired up at 2:30 UTC, delivering 65.8 Kilogram-force of thrust to slow Juno by 541.7 meters per second. Juno was aiming for a highly elliptical orbit with a low point around 4,000 Kilometers above Jupiter’s cloud tops and an apojove taking the spacecraft a little over 8 million Kilometers away from the planet. The target orbit was to take Juno around the planet in 53 days, ten hours and 3 minutes. Juno’s orbit has an inclination of 89.8 degrees, taking the spacecraft straight over the poles, coming in high over the north pole, making is closest approach around the equator and then heading out again when passing the south pole with only around six hours for meaningful science operations around the close pass. This orbital setup will not change significantly for the 14-day science orbit, the low passes will have the same duration. After some due celebration for Juno’s mission team, operations started in the early hours on Tuesday to downlink telemetry from the JOI maneuver to Earth for a detailed assessment of Juno’s performance during the critical engine burn. 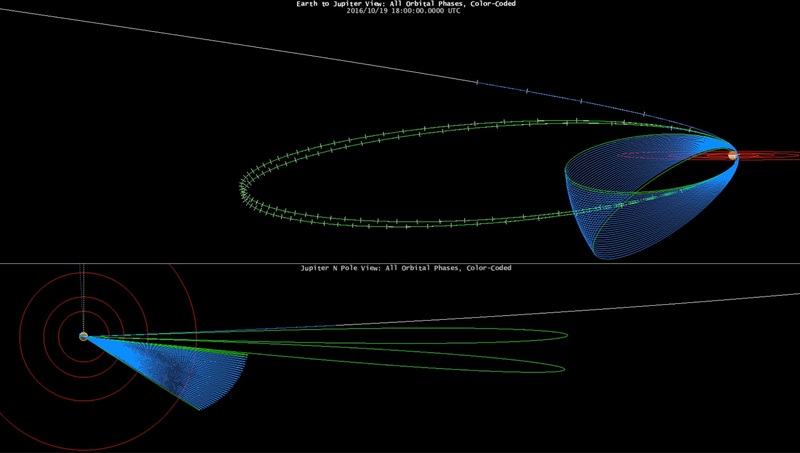 Ranging is also in progress to determine Juno’s precise orbit to set up for subsequent maneuvers. 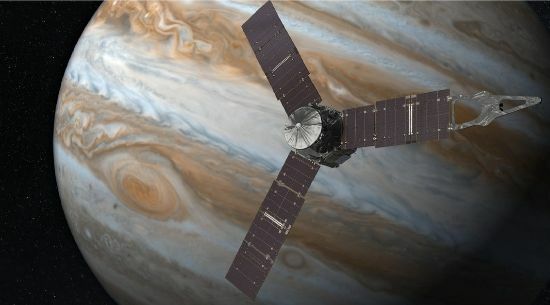 Juno’s instruments are expected to be powered up on Thursday, 50 hours after Jupiter Orbit Insertion to undergo a series of tests to ensure all nine are ready to capture data on the next low pass over Jupiter. 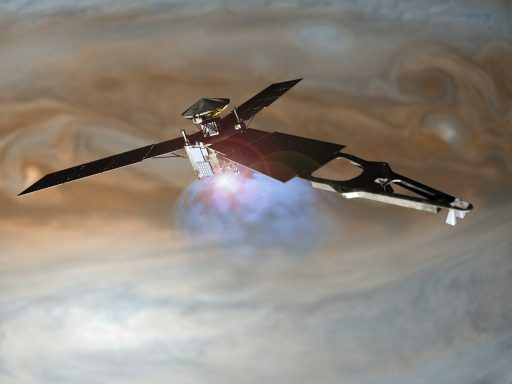 Some of the instruments will start gathering data when Juno is further out to study Jupiter’s magnetic field, plasma and radio waves, and charged particles in the vicinity of the planet. A clean up maneuver slot is available on July 13 with an approximate time of 17:59 UTC (Spacecraft Event Time SCET). This maneuver is only performed in case of any larger insertion errors to make sure the the first Capture Orbit’s period matches the predicted timeline to keep all subsequent mission events on schedule. Juno will then quietly continue on its outbound leg with regular data collection and instrument testing to set up for the science phase of the mission, also ensuring the data processing pipeline on the ground is up and running and the science team works smoothly. Juno’s first regular Orbit Trim Maneuver is planned around 17:59 UTC SCET on July 27 – a minor firing of the spacecraft’s monopropellant Reaction Control System to fine-tune the orbit – setting up the location of the first perijove passage. 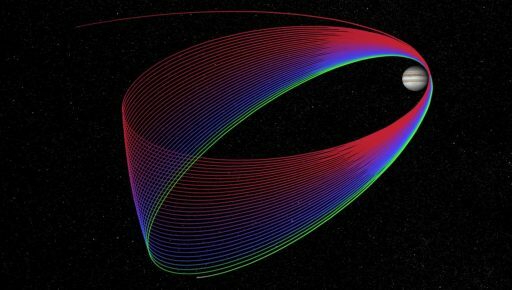 Orbit Trim Maneuvers (OTMs) will be performed on every orbit to ensure the subsequent low pass occurs at the desired longitude in a deliberate setup that ensures Juno achieves full coverage of Jupiter in a minimal number of orbits. Juno’s first orbit reaches its peak (apojove) on July 31 at approximately 19:42 UTC, from which point on Juno will be inbound again. As part of the inbound leg, Juno’s instruments will actively collect data and the science team will ensure all payloads are fine-tuned and ready for the first perijove pass, used as a dress rehearsal for the science phase. JunoCam will be tasked with collecting hundreds of frames to assemble a second approach movie. 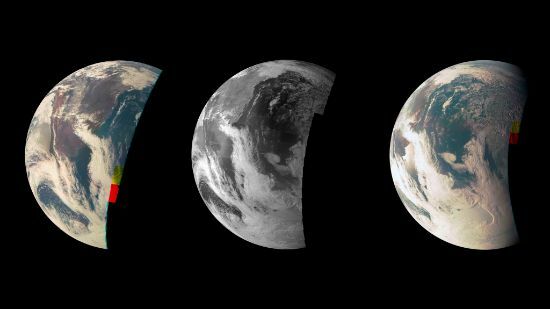 Because all instruments had to be shut down for orbital insertion, JunoCam’s first approach movie could only show the far-field approach with a small Jupiter in the center and its four Galilean moons in a cosmic dance around it. Heading in from eight million Kilometers, JunoCam will show Jupiter growing significantly in size as the spacecraft approaches, delivering the first detailed images of the planet’s north pole. Due to the close range of the approach, not all of the Galilean moons will be appearing in the image sequence. 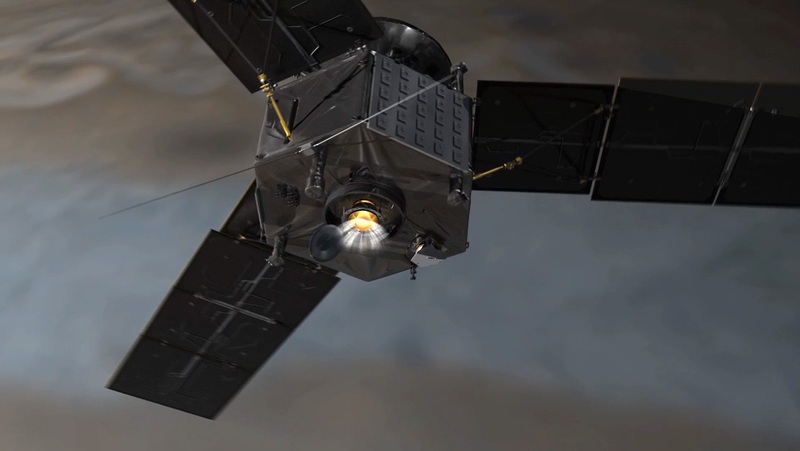 It is noteworthy that this represents the mission’s only chance of capturing this type of approach sequence since JunoCam and all other instruments will again be shut down during the second Capture Orbit for the critical Period Reduction Maneuver. Juno’s first low pass with all instruments running is set for August 27 with a time of closest approach estimated at 12:51 UTC SCET and a perijove altitude of 4,150 Kilometers. The data collection sequence around perijove picks up around four hours prior to closest approach and concludes four hours afterwards followed by multiple data downlink sessions performed over a period of days to get collected data to Earth and clear Juno’s memory for the next set. Outbound to eight million Kilometers for the last time, Juno will again conduct an Orbit Trim Maneuver to set up the track for the Period Reduction Maneuver, to be performed around Perijove #2. Due to the maneuvers performed during the first Capture Orbit and the second orbit’s OTM, the orbital period will be reduced slightly by around four hours and 44 minutes. Juno is expected to pass apojove on September 23, heading back in for the Period Reduction Maneuver (PRM) that will transition the spacecraft to its 14-day science orbit. Five days prior to the PRM, Juno will again switch off all instruments to avoid any instrument-related upsets impacting the operation of the spacecraft during the maneuver. 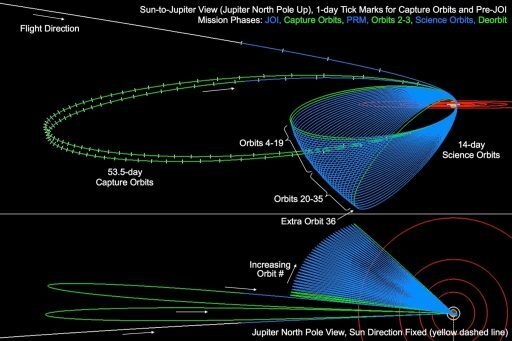 Juno’s Period Reduction Maneuver is set for October 19 and, in its general architecture, will be very similar to the Jupiter Orbit Insertion Burn: Juno will point away from the sun and Earth, begin sending status tones, face its engine towards the direction of travel and fire to slow the spacecraft down. Shorter in duration than JOI, the PRM will slow Juno enough to bring down the apojove altitude and reduce the orbital period to 14 days – 13 days, 23 hours and 41 minutes to be precise. The Period Reduction Maneuver is currently projected to start at 18:00 UTC on October 19 with Juno passing 4,180 Kilometers above Jupiter 11 minutes later, as with all orbits, flying from north to south. Orbit #3, the first 14-day science orbit, is considered a clean-up orbit to re-activate the instruments, and complete a PRM clean up maneuver, however, the mission team hopes to be ready for nominal science measurements on the next low pass on November 2 ahead of the mission’s first clean science orbit starting in early November. 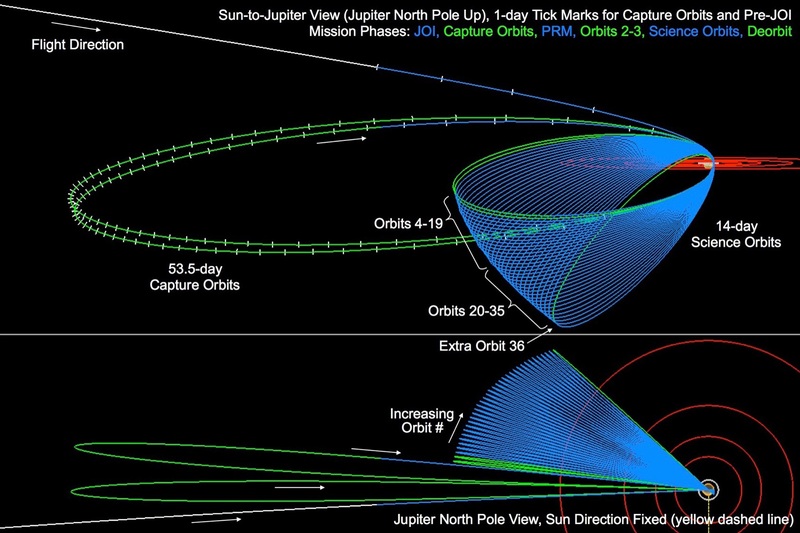 As part of its two-week science orbits, Juno will follow a sequence similar to its two Capture Orbits – science occurs in the hours around the close pass of Jupiter followed around four to eight hours later by a regular Orbit Trim Maneuver to set up the longitude of the next low pass in order to build a net around Jupiter. 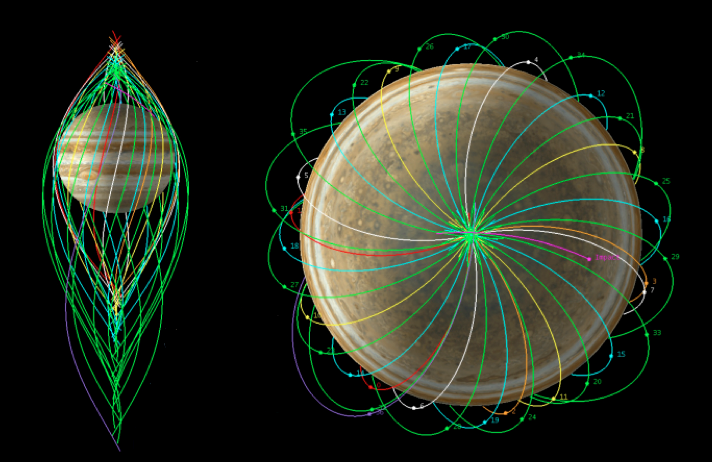 The first four orbits will be spaced in longitude by 90 degrees, the next four will be placed in the middle of the gaps to achieve a 45° spacing, eight subsequent science orbits will again target the middle of the gaps to reach a 22.5° spacing and the second half of Juno’s science phase will bring the spacing to 11.25°. This approach has been chosen to get a global picture of Jupiter relatively quickly into the science mission to protect for the event of a premature failure of one or more instruments due to the extreme radiation encountered by Juno. If everything goes according to plan, Juno will finish the final orbit of the primary mission with perijove on February 6, 2018. 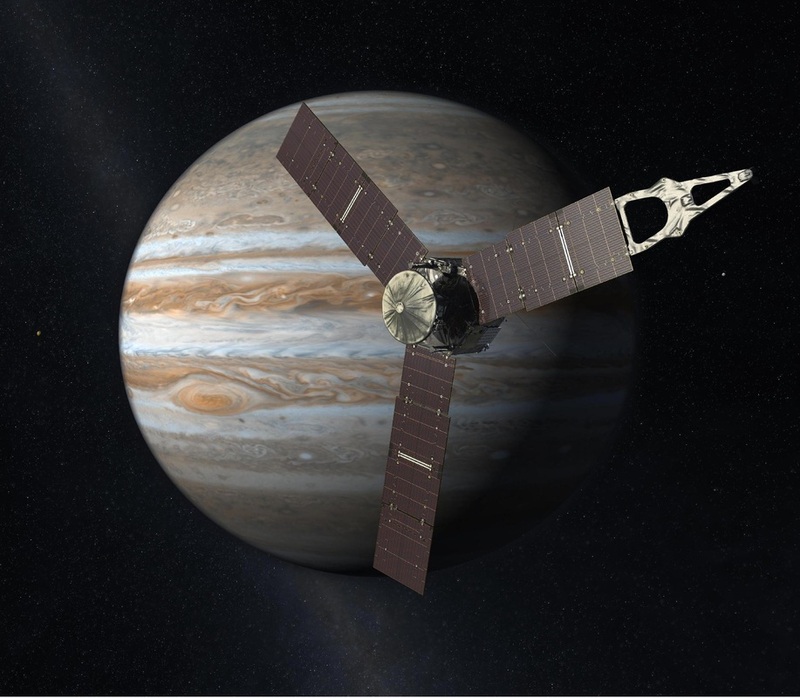 The primary mission is expected to end with a destructive entry into the Jovian atmosphere on February 20, a date that previously seemed to be set in stone as an extended mission was ruled out for planetary protection reasons. 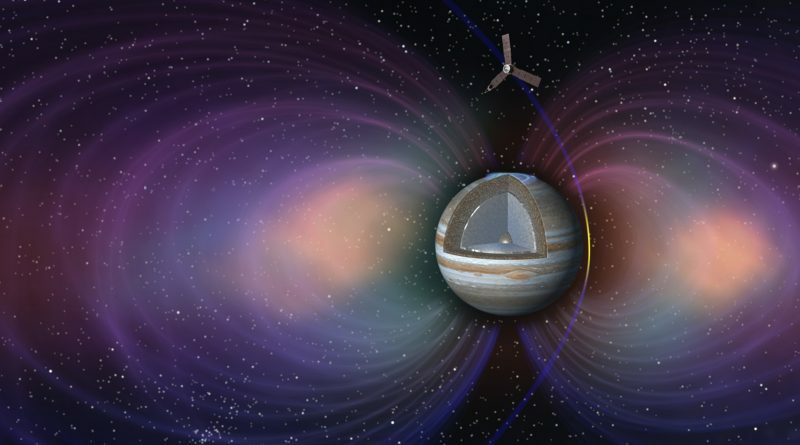 Newer information shared by the mission team indicates that a mission extension is at least on the table, pending Juno’s performance in Jupiter’s extreme radiation environment.